Before sharing the charts, let's think about UV and IR and visible "light". 1. You cannot SEE this type of "light". 2. You can feel the IR - it warms you up. 3. You can't see or feel UV, but your skin will fry if exposed too long, and paper, artwork, fabrics, and other materials will degenerate from exposure. 4. IR is heat, and we can capture heat images in a CCD or IR film - way cool to see. 5. IR can penetrate opaque material. UV cannot. 6. Visible light transmission through clear Plexiglas is 92%. You cannot detect the 8% loss - it looks clearer than water. You lose 4% reflected off the front surface and 4% off the INSIDE of the back surface. If I put a business card at the end of a 4" thick piece of Plexi 8 ft long, you could read it perfectly. OK - the charts - check this out! 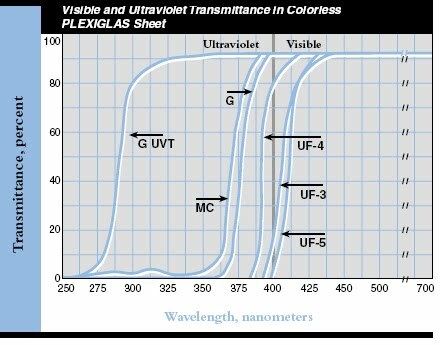 Your UV and Visible Light chart - you can see the natural drop of UV filtering from standard Plexiglas, and then the extra filtering of the UVF and UVT grades. Plexiglas MC is your standard general purpose extruded sheet, and Plexiglas G is cell-cast acrylic sheet. Plexiglas UF5 is the standard extruded "MC" with a UV filtering additive. UF3 is the version from "G" cell-cast acrylic. Colorless Plexiglas® sheet sheet transmits most of the invisible near-infrared energy in the 700 to 2,800 nanometer region, but it also absorbs certain bands as shown. The curves for 0.118 inch and 0.944 inch thick colorless Plexiglas® sheet show that near-infrared transmittance depends on thickness, decreasing logarithmically as thickness increases. At infrared wavelengths longer than 2,800 nanometers and as long as 25,000 nanometers, and in thicknesses greater than 0.118 inch, colorless Plexiglas® sheet is entirely opaque. At thicknesses less than 0.118 inch, Plexiglas® sheet transmits small amounts of infrared energy at certain wavelengths within this region. All standard formulations of colorless Plexiglas® sheet have the same general infrared transmittance characteristics. Sensitive instruments confirm that weathering produces no change in the infrared transmittance characteristics of Plexiglas® sheet. But wait, there's more! Here's the special grade of Infra-Red Transmitting sheet. It is BLACK in color, but allows the IR to transmit through. Very cool for spy related video equipment. Available in 1/8" and limited amounts of 1/16" thick. Here's the chart for POLYCARBONATE sheet - known as Lexan, Tuffak, Makrolon etc. Note that polycarbonate goes opaque in the UV spectrum and has good IR transmission. question : Over time will UV light breakdown plastics having the effect of transmitting more UV light? If so would the UV light have the opposite effect on plastics created to permit UV light ? ie. Animal habitats, Solariums, and Tanning bed acrylics? OK - good question! Acrylic is naturally UV-resistant. So no worries about breakdown. The main application for this formulation is sun-tanning beds. Any idea about transmittance above 2200nm for Polycarbonate? I hope to use it as a filter for light in the 10,000-11,000nm range. thanks for the awesome write-up. do you know of a filter that can block all (or almost all) visible and transmit only the IR from a 1000W tungsten lamp? i *want* only the IR, and i want to throw away the visible light. Hmm - I don't know of a material existing right now with 1nm to 1240nm transmission. Tall order. Maybe can be made... What is the application? I need a product that will allow the light from the IR LED's on my new back up camera to pass, what product do you recommend? Do you have a recommendation on a plastic that would be good for simple gears (in a toy) and nearly opaque to 940nm? I WANT TO USE IT ON MY SOLAR PANEL. What would be your recommendation of multiwall/honeycomb product/s for achieving maximum IR & near IR transmission for a solar thermal application? While the highest transmission will obviously come from a single-wall sheet, the multiwall/honeycomb requirement is in order to minimize conductive/convective losses at the cost of some transmission loss. I am making a LED interactive modular floor for which I would be using IR sensors (emitter+photodiode). I would be using plexiglass. I just wanted to know how could i avoid the interference of the other IR radiations in the room? Great info. How about a plastic that will absorb (not reflect)most IR but either efficiently transmit or reflect visible (UV is good too, but not essential)? Is there a maximum distance an infrared sensor can be set back behind the plastic window using the 1146 without effecting the sensor performace? I would like to build an UV detector, so I need to block any wavelenght below 250nm and above 400nm. Do you know any plastic or several of them together that can suit that filtering? Thanks! Tough one. Maybe a specific color that matches those wavelengths? Thank you for the great information. Hoping you might be able to help me out with your knowledge on this subject. I have some Polycarbonate lenses that are range from about 1/4 inch to 1/2 inch thick. They have markings (small etchings) on the top of the lens that I want to be able to read with a camera. I'm thinking of using many IR LEDs to either backlight (or light from the top) the lens with hope the camera can see the etchings. Do you feel that IR will work for this on the Polycarbonate lens? Also what wavelength (nm) of IR LEDs would work best for this thickness of Poly? I was thinking around 1000nm. Thank you very much! We are familiar with the effects of UVA and UVB, however not UVC. There have been no reports to us of UVC light being an issue with any UV-blocking acrylic application during our last 101 years in business. If more information is critical to your project, we recommend you call in and we will find the answers for you. 1-800-474-3688. The very last chart shows IR transmission through a polycarbonate sheet. Can you please provide more info as to which sheet this statistic is about? I'm designing a new product using molded polycarbonate components. We inspect the parts after annealing using a modified polariscope to check of abnormal stresses and other defects. Works very well for the translucent parts but, in order to maintainthe same look & feel of the original product we want to keep the opaque base black. Considered just making the black just a little more transparent but still looks black and use a stronger light source. Might try IR illumination instead. Do all sheet clear acrylics block the harmful lower-end UV in the same way as does the Plexiglas MC? They should because they are all made form the same PMMA polymer, but testing would need to be performed to determine with certainty that it meets your criteria. The PDF download below might help a little. It's a UV Filtering document from Acrylite. Plastic Genius: I have a Texas Instruments TMP006 that I want to mount in a plastic enclosure for measuring the temp of an object outside of the plastic enclosure. The TMP006 is a IR thermopile for non-contact temp sensing with a wavelength of 4um-16um. Would the IR of the sensor pass through polycarbonate well enough that I could use an enclosure with a polycarbonate lid? The best I can say is probably, but you will need to test the material on your specific application to be sure. If you email info@eplastics.com your name, shipping address, a copy of this post, and what you need to test, then they will send you a small sample for testing. I am looking for clear plastic sheets that absorb minimally in the ~ 400 to 750nm region. I a=need this for short term ( ~ 3 weeks) experiments so longer term durability is not an issue. Is such a plastic available? It’s a special-order material that may require extra time to acquire. Feel free to email info@eplastics.com if you need any more information or a quote for that material. UVT acrylic is typically used in tanning beds, and is offered through special order at info@eplastics.com in 48" x 96" sheets. Keep in mind though, that the wavelength that tans you is much shorter than the wavelength for photosynthesis, so it might be better to keep them separate of each other. I'm looking for a type of plastic that is dark enoungh to reduce the brightness from an IR laser from a scanner but clear enough not to reduce its performance at all. Maybe our IR transmitting acrylic if the scanner work in the correct wavelengths. If that doe snot work, you might be able to use a transparent grey or bronze color, but I imagine it could potentially affect the outcome (visually). Can you recommend a plastic/glass that can be used with UVC, allowing the greatest percentage of the light to pass thru, to be used for sanitizing/disinfecting purposes. Thank you. Hi- we would recommend an OP2 sheet (http://www.eplastics.com/Plastic?search=op2). 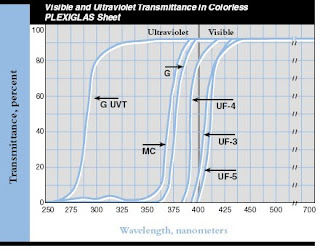 You can also reference this chart on UV filtering plexiglass. Hello- for IR- what would bethe best clear spray would you recommend for blocking out IR ? hello- what clear spray would you recommend for blocking out IR - could I purchase this spray at a local paint store? Hi Dale- thanks for the comment, but unfortunately that is not really our field of expertise. What would you recommend as a clear plastic (for outdoor use) must be IR blocking or reflective but still retain clean and clear look.It should be somewhat flexible as well so a thin but semi rigid characteristic. Everything I have seen with IR blocking has some reflective material on top or inside it. Check Lucite/Lux IR blocking acrylic on the Lucite website. We are looking for a semi flexible (thin) plastic material that is clear and reflects or blocks IR light.Application is a modular greenhouse for herb gardens and specifically African Violet seedlings. where can you buy a UVT sheet of acrylic? You can purchase UVT acrylic sheets at www.eplastics.com, but it's a special order so you need to call and minimum order quantities might apply. Typically measurements and charts show UV transmittances as 100 or 99.9% (for say things like polycarb). Is there a need to extend into the 4, 5 and 6 decimal places? What instrument is used to measure this tiny transmittance? Thanks! The need for greater precision in those numbers will depend on your application. Do you a specific application in mind? In order to measure transmittance at that level of accuracy you would use a spectrometer. This article from Ocean Optics discusses measurement of UV-VIS transmission of plastic tubing: http://oceanoptics.com/measuring-the-opacity-of-plastic-tubing-with-vis-nir-transmission-spectroscopy/. I have seen reference to white translucent Makrolon. What would the IR transmission through this material as compared to the Black? Wait, so if I wanted to let uv light transit I would use the G UTV? That is the one they would use in tanning beds? Just want to make sure I am reading that right. Since this post was written we have added more information to our website here that should make this more clear: http://www.eplastics.com/Plastic/plexiglass_acrylic_sheet_uv_filter. There are special 'uv transmitting acrylite OP4 UV' sheets that are manufactured for use in indoor tanning equipment. It offers high levels of UV light transmission and strong resistance to degradation caused by UV light. OP-4 acrylic sheet transmits a high percentage of UVA and UVB light. Only a small portion of light in the UVC region (200 – 280 nm) is transmitted. If you are interested in purchasing this material or have additional questions give us a call at 858-560-1551 and someone will be happy to help! Thanks for the excellent overview of IR Transmission! We are looking for a plastic that allows transmission of IR with wavelength of 8 to 14um (to be used for protection of an IR Temperature Sensor) but are having difficulties finding something. Any ideas regarding that wavelength (8000 to 14000nm)? Hi- we offer IR Transmitting Plexiglass sheets that might work for your application. You can see the details and wavelength specs here: http://www.eplastics.com/Plexiglass_Acrylic_Sheet_Infrared_Transmitting. I need a vacuum formable plastic that wont shatter, is food grade and will pass UVB and UVC , any suggestions? The OP4 will transmit high levels of UVA and UVB, but only a small portion of UVC. It is also vacuum formable. Since it's special order we would have to check to see if it's 'food grade'. Some plexiglass is considered food grade and some is not. It depends on the materials used and the manufacturing process. Give us a call at 858-560-1151 (7:00am-5:00pm PST, M-F) and someone can look into it for you. Hello- thanks for the question! You can also give us a call at 858-560-1551 and a sales person can assist you. Hi there, Which material can replace the Windows glass to get Vitamin D from direct sun light through the windows into my room? If you want the benefit of Vitamin D from direct sunlight you need material that allows UVB light to pass through. There is a special type of acrylic that is designed for this purpose called "OP4". You can find more information here: OP4 Plexiglass Sheet. Please keep in mind that this is a special order material, so if you have further questions or are interested in calling you can reach ePlastics at 858-560-1551 between the hours of 7:00am and 5:00pm PST. I noticed that you reply to Samy same answer I'm passing the UVB and he is filtering it, how it comes? Explaine please. I may have just misunderstood your application. Here is the link for the Infrared Transmitting Plexiglass. Here is the link for the UV Filtering Plexiglass. Please advise if plexiglass or cast acrylic can filter 254 nm of UV light? Please keep in mind that this is a special order material, so if you have further questions or are interested in purchasing you can reach ePlastics at 858-560-1551 between the hours of 7:00am and 5:00pm PST. Do you have the transmission spectrum for those blue 3 and 5 gallon polycarbonate carboys used for drinking water? Sorry, we don't sell or work with that type of material so I don't have that data. Do you stock a black plexi that can be back lit without a translucent border around the sign or is it all 0% light transmission? We don't currently stock this type of material, but it's possible we can special order it or find another type of plastic that will meet your requirements. Give our sales department a call at 858-560-1551 or email info@eplastics.com and someone will help you out. we are looking for a plastic which can use as moulded cover for copper bar joint in electrical connections. And this Cover to be able to scan hot joint (temperature scan) by IR Camera. could you recommend a plastic or combination to pass IR transmission (with specific colour) ? Based on your comment you are probably looking for some type of Infrared Transmitting Plexiglass. All plexiglass sheet is infrared transmitting. This grade is opaque to visible light and allows infrared light through. Unlike glass, you can put all grades of plexiglass in front of DVR's, cable boxes, DVD players, etc. and your remote control, wireless router, etc. will still work. This particular acrylic material is black and only transmits infrared, which makes it ideal for hiding a CCD video camera. If you have additional questions one of our sales reps can help you at 858-560-1551 or email info@eplastics.com. If you want to transmit both visible light and IR you can use standard Plexiglass Sheets. The IR transmitting sheets referenced here are mainly for applications where you want to transit UV light but exclude visible light. What are the transmission percentages of polycarbonate, specifically lexan, in the 10000nm range. Everyone says you can use it to protect against a c02 laser, I've never seen any actual documentation to back that up. A white paper or case study link would be helpful. I don't know about Lexan brand specifically, but I checked with our vendors who manufacture general purpose polycarbonate sheets and they directed me to this spec sheet: General Purpose Polycarbonate Sheet Data Sheet. If you still have questions give us a call at 858.560.1551 and a member of our sales team can assist you further. I would need a stuff that would block all UV light from 225nm to 420nm but would allow seeing through it. If I understood right, clear polycarbonate and UF5 Plexiglass would be suitable, but would amber coloured MC do the job? You have a few options here, the ultimate decision will depend on your application and other needs for the material. The UV Filtering OP3/UF-5 Plexiglass Sheets will block 98% of UV rays and is frequently used in museums. Makrolon® AR abrasion resistant polycarbonate sheet offers higher UV resistance and abrasion resistant surface hardness to polycarbonate's inherent performance benefits of impact, strength and clarity. If you need additional assistance give us a call at 858.560.1551 or email info@eplastics.com. Usage is for a 3d printer which uses resin that is hardened by UV. The idea is being able to see the printing process and not allowing UV from the printer harming the watcher nor UV from the ambiance light interfering with the resin in the printer. Many printers have a tansparent orange or amber acrylic hood. The question is would standard MC plexiglass stop UV merely by the fact of being coloured or do you need an specific grade like OP3/UF-5? What you are seeing with other people is probably this material: 2422 amber plexiglass acrylic sheet paper masked. This plexiglass color is 100% effective of blocking all ultraviolet wavelengths. It cuts off light at the 540 wavelength and works great for UV curing operations. Thank you, Elliot, that's the stuff! About the above chart for polycarbonate, to what minimum thickness does it apply? The thinnest we stock, which is labeled as 100% blocking, is the 0.125" thickness. Hello, are any of you aware of a material that is particularly IR-absorbing? I have an application in which I need to transmit IR through one material, and have it be absorbed by the next material that it hits so as to not reflect back. Thanks in advance, I've been looking all over! Do you have any recommendations for films that are UV resistant, FIR transparent and potentially weatherproof? I am not aware of a plastic film that meets all of these requirements. What is the application for the material? It's for an experiment to determine how much a warm/hot body encased in a box with a single film surface pointed up to the night sky can be cooled through radiative heat transfer. Hence the need for high Far Infrared transparency. Would these thin infrared transmitting acrylic sheets work? Hard to say. Do you have any technical data sheet for the product? This is part of the Plexiglas G line, here is the data sheet from the manufacturer: Plexiglas G Cast Acrylic Sheets.